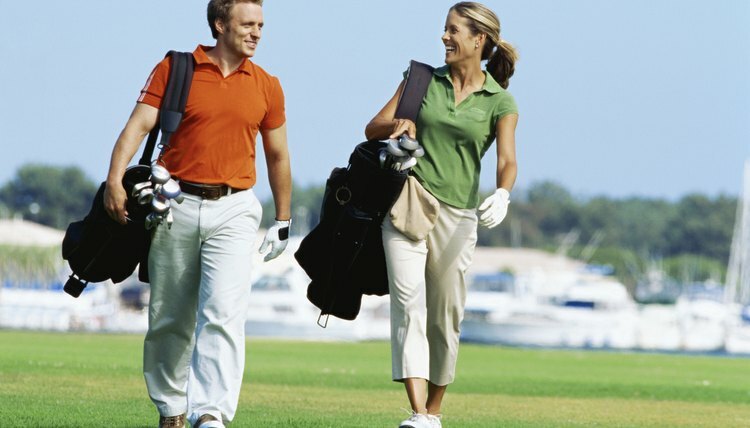 If you play golf with your spouse, you may need to adjust your handicaps for different tees. Normally, applying your handicap to a specific golf match is a straightforward, two-step process: look up your course handicap, then do the math. When opponents are playing from different tees, however, the calculations require some extra steps. But don’t let that scare you away from playing with someone who hits from a different tee box. You won’t need a calculator to adjust your handicaps. You just need to learn the correct formula. Look up your course handicap on the chart that’s typically located in the clubhouse or near the course’s first tee. Use your USGA handicap index to find the corresponding course handicap for your set of tees. Compare your course handicap with your opponent’s. Whoever has the higher course handicap will receive the appropriate number of strokes. For example, if you have a course handicap of 5 playing from the back tees, while your opponent has a course handicap of 12 playing from the forward tees, your opponent receives seven strokes. But the calculation doesn't end there. Look up the course rating for your set of tees, which is generally listed on the scorecard and measures the course’s difficulty. Subtract the course rating for the easier set of tees from the higher course rating for the more difficult tees. Round any decimal of .5 or more up to a whole number to determine the number of strokes that the golfer playing the more difficult set of tees receives. Subtract the Step 4 figure from the Step 2 figure to determine the final number of handicap strokes. If the result is a negative number, the golfer playing from the more difficult tees receives the strokes. In the case of the previous example, if the back tees have a course rating of 73.3 and the easier tees have a rating of 71.1, the difference is 2.2, so the golfer playing the back tees receives two strokes. Subtract the two strokes from the seven handicap strokes from Step 2, and the golfer playing the front tees will receive five strokes for the match. Alternatively, if the golfer playing the front tees has a course handicap of 6 – just one higher than the golfer playing from the back tees – then the player on the more difficult tees receives one handicap stroke for the match after the two-stroke difference between the course ratings of the front and back tees has been applied.